Fox haters never let a tragedy go to waste…especially when it’s another opportunity to lie! 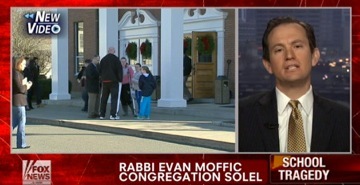 Memo to Fox News: See, there ARE Jews in Newtown. Fox has acted like there are only Christians in Newtown or that only Christianity is for the victims. The Fox religious message was clear and, considering that the shooting happened during Hannukah, which ends tonight, very Christian…While Fr. Morris' Christian words might be inspirational, to some, shouldn't a "Fair & Balanced" news network provide some other religious and non-religious perspectives? And while 70% of Newtown's population is Catholic there are other groups - 6%, Jewish and 10% of the 24% of "other" groups are liberal mainline Protestants as well as 2% Muslims. But on Fox, the religious perspective, so far, has been from the Catholic Fr. Jonathan Morris and the evangelical Mike Huckabee. [Dollar] falsely accusing us of not watching Fox, when I can assure him that we do. So that would mean Priscilla knew she was smearing Fox with a bald-faced lie but went ahead and did it anyhow, just to paint FNC as exclusionary and vaguely anti-Semitic. It’s bad enough to exploit a tragedy to make hate-filled agenda-driven attacks. But to falsify the truth, to concoct a notion of anti-Semitism and then blatantly lie to ‘prove’ your case…that is despicable even by the seamy, degenerate ‘standards’ of the newshounds.